Given my current benefit of hindsight, it's pretty damn clear that both Beatlemania and Ann-Margret inadvertently hindered this musical-movie quite a lot. The Beatles: because at the time their popularity started to overtake Mister Presley's. And Ann: because there was a rumor brewing, alluding to an affair they were then having. Poor film. One made in 1964, and lasting for a whole 85-minute's. Boy-oh-boy! Life sure is fun-fun-fun living in Las Vegas! Take the life of racing-car driver, Lucky Jackson (Elvis Presley), for instance. By day, he gibes with his fellow racing-car driver, Elmo Mancini (Cesare Danova), about an up and coming race that's on the horizon. Whilst by night, both he and Elmo prowl the clubs for that pretty young gal they bumped into during the day -- Rusty Martin (Ann-Margret). Hey! Wait a minute! You do know who Rusty is, don't you? She's a singer. She's a dancer. Plus she is the long-legged-lass who is willing to go out with Lucky, just after he looses all of his money when he trips up and falls into a swimming pool. Oh! Isn't that a shame? Lucky without a dollar to his name. How in hell is he going to raise some funds for his race now? His mechanic, Shorty Fansworth (Nicky Blair), hasn't got a ratchet to spare. Plus Rusty's nautical father, Mr. Martin (William Demarest), hasn't any cash to splash either. Hold on! Maybe that talent contest might help Lucky out? You know, that one the resort Lucky is forced to work in is currently holding! Maybe -- Maybe not. But then again that's most probably why what next transpires, has a song and dance when Elmo starts to make a move on long-legged Rusty. As music is live - contests do the jive - cars gets into gear - and a driving completion ends in an enormous cheer. YAHOOOOOOOOOO! Thank you very much. Alright, I have to admit. 'Viva Las Vegas' isn't a 'Goodfellas' by any stretch of the imagination. Moreover, 'Viva Las Vegas' isn't a 'Good Night, and Good Luck' either. Still, what it is; is fun-fun-fun; wrapped in 85 minutes of wall to wall singing, dancing, and adventure, which I have to categorically state for the record, was one hell of a roller-coaster ride I was more then happy to be a part of. Honestly. No kidding, dear reader. I really did like this movie. Granted, the story was one of those groan-worthy amalgamations of an abysmal plot, mixed in with some unreliable endeavors. But what the heck, huh? The music and the charm more than made up for these obvious pitiful, without a shadow of a doubt. However, before I tell you the reasons behind my statements, please allow me to spill some filmic-facts first, OK? (1) 'Metro-Goldwyn-Mayer' released this picture on the 20th of May, 1964. At the time, it shared a double-bill with the Nancy Kwan and John Fraser romantic-comedy, 'Tomahine'. (2) Its pretty safe to say that Elvis' character makes a factual error prior to singing the song, 'The Eyes Of Texas'. John Wayne wasn't born in Texas; he was born in Iowa instead. (3) Did you know that this film has been referenced, spoofed, and featured, in many different types of productions ever since it was made? 'Fear and Loathing in Las Vegas', 'Con Air', and 'Contact', have all referenced this movie. 'Good Morning Vietnam', 'Austin Powers', and 'The Simpson's', have all spoofed this movie. Plus 'Colour Me Kubrik', 'Love Stinks', and 'Elvis Found Alive', have all featured this movie as well. Oh! And, many-many more. 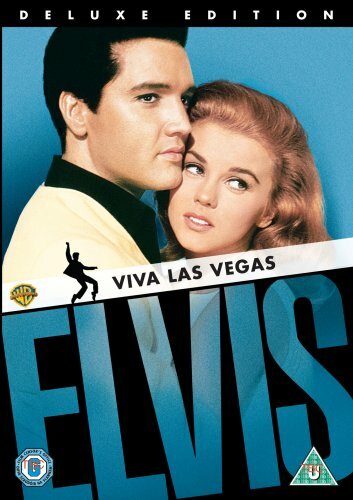 (4) Considering that this is one of Elvis Presley's most popular and iconic movies, I'm sad to say that the critics really panned it in the press at the time. One journalist -- for the New York Times -- said that is was 'as pleasant and unimportant as a banana split'. Whilst another journalist -- for 'Variety Magazine' -- stated that 'this production was a pretty trite and heavy-handed affair'. (5) Country and western singer, Glen Campbell, was one of the guitarists on the soundtrack. (6) If you look very closely, you will notice that the electric guitar 'Lucky' is playing in the 'roulette wheel scene'; isn't actually plugged in. Also, if you look closer still, you might be able to spot 'Young Frankenstein's' Teri Garr as one of the 'Showgirls' dancing on stage. (7) During production, tabloid journalists mistook the scene where Elvis married Ann-Margaret to be a real wedding; and published photos stating as such. Ha! What silly-silly journalists. 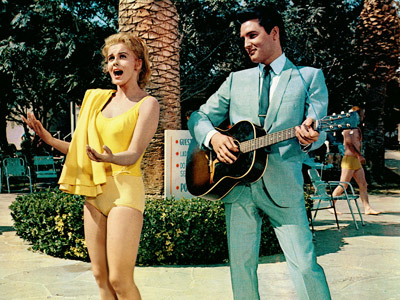 (8) Although it wasn't used in this film, Elvis and Ann recorded the Leiber and Stoller penned duet, 'You're The Boss'. OK, I'm sure you're wondering to yourself why I enjoyed 'Viva Las Vegas' so much, right? Well, there was this one scene -- about half way through the picture -- where Elvis' character was trying to sabotage a dinner between Ann and Cesare's characters. Wow! Was that scene a blast or what!!! To me, it just showed that Elvis really could act. He was funny. He had good comic timing. And you could tell that he was 'in the moment' just by the way he behaved. Damn! Isn't it a shame that 'The Colonel' didn't allow him to do films with a larger scope? In this one, Elvis did emote a lot of 'color' though his wares. When he was sad he looked sad. When he was happy he looked happy. And when he was randy -- err -- Ann-Margret could make anybody fell randy when you see her in this flick! Holy Toledo! What a girl she was, huh? 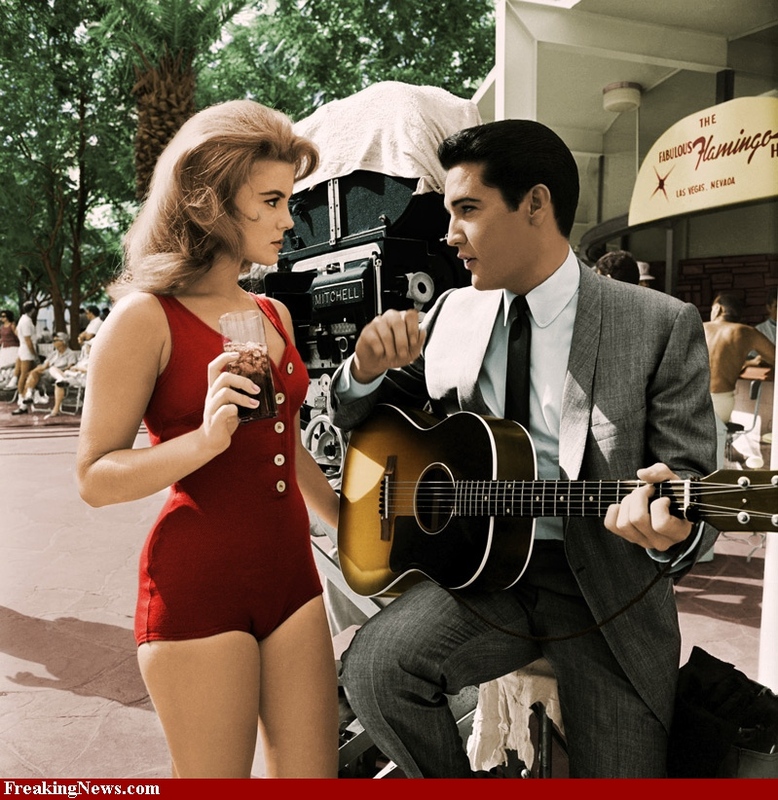 No wonder the press thought that Elvis was shagging her during production. She was one dazzling lady. Effervescent. Fruitful. And... and... and... I best take a cold shower pretty damn soon me thinks. Or else I may do a song and dance number in my pants. Oh! That reminds me. Before I do shoot off to cool myself down, I best mention the music. Nice film. Silly plot. Lot's of charisma. And say no more.